Well, here we are. 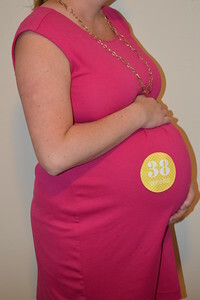 I made it to my 38 week update. No more pregnancy updates... ever again. For the history of time. Unless Jason Statham is in desperate need of offspring. Then, ya know, maybe we could have a discussion. After a lot (and a lot and a lot) of practice making said fictitious baby. At 37 weeks all my sinus/ear/bronchitis stuff was pretty much under control, with the exception of the rib pain. It actually got worse. So much worse that I couldn't even lay on my left side at all and was grimacing even when I was laughing because it hurt so bad. My OBGYN finally saw me (since I hadn't seen them since prior to all of that crud) and she talked me through my symptoms and eased my mind that it wasn't a blood clot. I knew there wasn't anything they could do for me with a possibly fractured rib (or strained muscle or inflamed cartilage - or whatever else they couldn't diagnose without an x-ray) but the peace of mind was nice. I suppose. I was still in agony. On the bright side, I had lost a few pounds due to being sick (they hadn't wanted me to gain any more) and I was measuring OK and the baby's heartbeat was perfect. The doc did note how much room Healey is taking up in my stomach though - she is maxing out her space! Sleeping is so much more uncomfortable. If I lay on one side for too long, the poor girl gets shifted that way and my stomach gets all bent out of shape and I have to sit up for a few minutes (several times a night) for her to settle back in the middle and for both of us to get comfy again. I can feel her super low too - she has noticeably dropped. So much so that I have been in constant fear for at least 2 weeks now that she is going to come early! I saw the doc at 38 weeks and had them check me, just for my own information. I was already 2cm dilated and 75% effaced. Yup... this baby is definitely on her way! I am trying so hard to relish in these last few days of this pregnancy. For as much as I've complained the entire time since I've felt like crap for most of it, it really is an amazing experience. And every last sleepless minute or back ache is totally worth it once Healey is in my arms. With her running out of room, I can feel her little legs and feet distinctly sometimes. I just cannot wait to see them on the outside and snuggle up with her. I don't want to rush any of her babyhood... but I am over being pregnant. Let's be real. I want to hold her in my arms. Thankfully, just a few more days until that is a reality. The best reality ever!